Handprint & Footprint crafts are always a big hit around here, and this one was no exception. It’s been a while since we’ve done a footprint craft and it was hilarious to all involved to see how big our 8-year-old’s foot has gotten. It takes up the majority of a sheet of paper now! =) I thought this craft up ages ago – it just took a while to actually get to it. As you can see, we made hummingbirds out of both girls’ feet. Our 14-month-old did remarkably well, though it is smudged and not perfect. If you have a toddler, please don’t expect it to be! I had my husband holding her hands and my older daughter held on to her feet. It was definitely a team project, and without their help it probably would have been a hot mess. – Paint your child’s foot green. – Gently press onto the piece of paper. – Clean off the foot, then repeat with the hand. – Allow to dry, then paint on the eye and beak. My kids love this project so much. So fun to play with my little kids. Love your cards and your tutorial too! Grandma asked me to do this with her. It came out beautifully. Big Thanks! 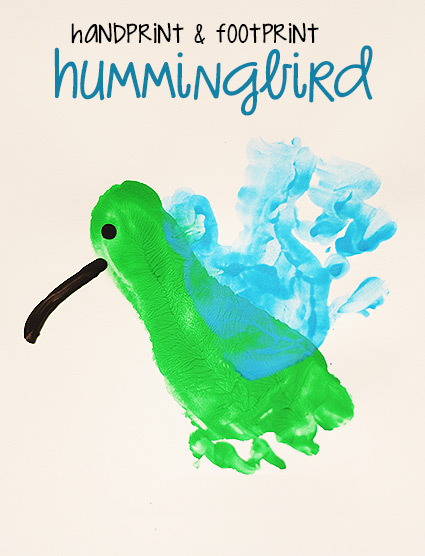 Hey Buddy!, I found this information for you: "Handprint & Footprint Hummingbird DIY". Here is the website link: https://charmpopcards.com/handprint-footprint-hummingbird-craft.html. Thank you.